We're back for 2018 at Surfer's Point on the weekend of 3rd and 4th February. As usual we'll aim for the comp on the Saturday but make a final call in week before when the forecast is out. The event will also see the Australian Premiere of That's Surf West Movie on Saturday night at Redgate Wines. Simon from Margaret River Stand Up Paddle will be providing transport to and from the party at Redgate if you need a lift and the parents of the South West Junior Windsurf School will be running the bar and providing food at the party with all proceeds to the school. With Respect BTB. This is probably the first time many have heard about this event. Also the Brands may have not even been contacted and asked for support, I know this to be the case in for at least two brands. The "Brands" have lent support to other events this season so far ie the Simmer style wa slalom series, the Windtech KA Cervantes weekend, (with other brand contributors), and also the Junior windurf schools have had a lot of support from Starboard, Severne amongst others. Just like your dollars, they only stretch so far. Support for riders is part of the support for the sport. Most contest participants would rather a nice dinner or carton of favourite beverages as spot prizes rather than another pair of harness lines. Or perhaps you would like to see the same winners walk away with the prizes or cash as usual. Well done to PJ for his support and the margies crew for getting the event into place. This season we have had great support for all the major brands represented in WA as per every year. Without this support WWA could not hold events. WWA is very specific on who we contact for sponsorship and the windsurfing industry is small so sponsors from outside the industry are critical. For Margs we are able to obtain sufficient support from outside the industry from our awesome local sponsor so we didn't contact industry sponsors this time around. Industry support is critical for other events where there isn't the local industry support so we need to share the love. Hope they get an all time swell. You'll find that the sponsors this year are local windsurfers themselves, myself included. PJ, Simon and I are small business owners living in the area and are mad keen on getting out on the water everyday and supporting the SUP/windsurfing industry. Just like Paul said the windsurfing industry supports a lot of other events throughout the year and for me the Margs Wave Classic was a good opportunity for myself and others, who aren't so major, to show our support. ^^^ Which one of you owns a brewery? Unfortunately we cannot rely on last minute entries for these events as we need to prep catering, rescue cover etc and for this we need a reasonably clear idea of numbers before the morning of the event, ideally a week in advance . If you're thinking of turning up to compete then let me just say it's a great way to get an uncrowded session at main break, we have 2 jet skis to provide rescuer cover/a tow back to the beach so there's never been a better time to have a crack. The knockout system we have used for the last few years gives everyone at least two heats (a bit like the WSL format) even if you don't win in the first round. Elite The top tier, for professional and sponsored sailors. Open Not at professional or sponsored, but striving to win and have a reasonable skill level i.e. landing forwards and general carving up the waves. Weekend Warrior This is the category for those not at the level of open. This division also gives people an entry point into competition rather than having to go straight into the Open Fleet. If you're wondering where masters and grand masters have gone then a) we all got old so there would have been no one left in Open, b) the standard was as high as Open anyway for the most part and c) with fewer fleets we were able to adopt the second chance knockout system and give everyone more time on the water. 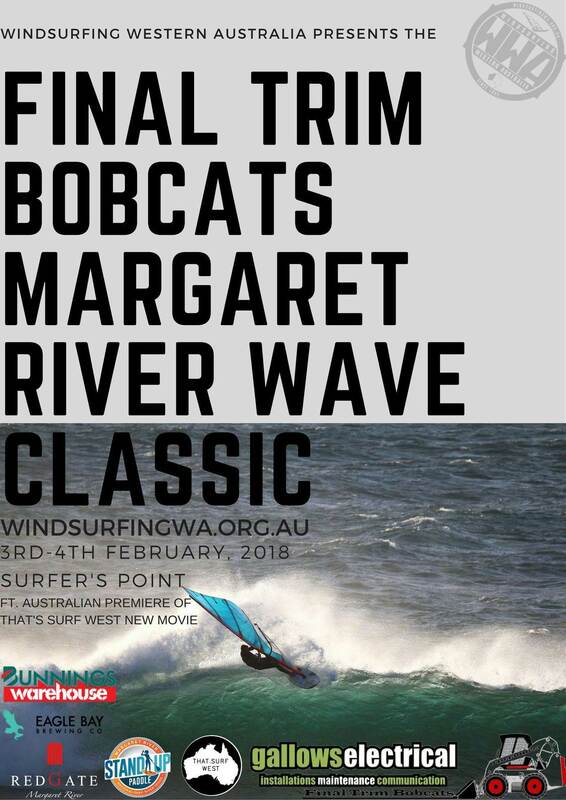 The party will feature the first Australian showing of That's Surf West film, food cooked by the SW Junior Windsurf crew and I'm told very well priced beer and wine from Eagle Bay Brewing and Redgate Wines. Simon from Margaret River Standup paddle will even ferry you to and from the party. What more could you want from a weekend away! Unfortunately due to the poor weather forecast for the coming weekend the comp will be cancelled. We are looking into the feasibility of holding the event on another weekend and will make an announcement in the next few days. If you did buy tickets you should have received an email regarding refund options.